It's amazing what Pechanga chooses to BANISH tribal descendents for. It's WELL KNOWN that they have a child molestor in their midst as well as many of the Masiel Crime family with violent offenses that bring police to the reservation. 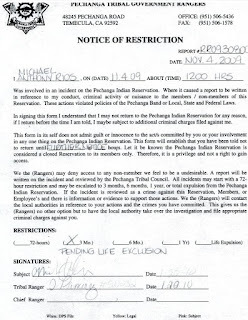 Those dastardly villains who come onto the reservation, TELLING the security guards WHAT THEY are doing there, then get detained, searched and now face LIFE EXCLUSION for merely being on the land they OWN? Does anyone know if that baby sitter is still locked up in jail, aka Vincent Ibanez. Or has he been released and started a new daycare some place in Riverside county.